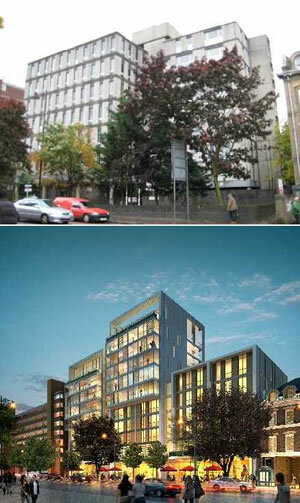 Approval of Plans For The Tileman House - Economic Boost Or Over Development? The existing nine storey high 1960’s block will be replaced with a glass fronted structure containing 68 flats - including 12 that will be offered to low income buyers on shared ownership terms. The new building will range in height from six to 11 storeys. And in a ground-breaking move by councillors, the legal agreement accompanying the planning permission will contain a clause stipulating that if the housing market in Putney improves before construction work commences, the proportion of affordable homes will have to increase. New shops and restaurants will be sited at street level along the Upper Richmond Road. “Councillors on the committee considered this scheme very carefully indeed and decided that on balance, the application should be approved. “This development will breathe new life into this part of Putney and make a valuable contribution to the area’s regeneration. It will bring new homes to Putney, new shops and businesses and new jobs. This development will provide a great boost to the local economy. However many residents are disappointed by last nights decision, fears were voiced on the forum of PutneySW15.com that should the revised application was passed it would increase the "canyon-like" appearance of this section of the Upper Richmond Rd.
" The council's detailed planning policies for the Tileman House site are set out on pages 134/135 of the Site Specific Allocations Document published by the council in October 2010. The Design Principles set out there includes a list of four specific design objectives which apply to this site and which any proposed redevelopment should satisfy. The planning application before the Committee clearly failed three of these four objectives. A rational Committee would have refused this application because of this failure. But no. The members of the Committee, in discussing the application, made scant reference to the council's planning policies in the Local Development Framework (the 'development plan' for the borough) with its Core Strategy, Development Management Policies Document and the Site Specific Allocation Document. There was no mention at all of the 'design objectives'. Was 17 March 2011 the day the council's Local Development Framework died?" The Putney Society in its has responded to the Council's release has described the Council actions as demonstrating "a cavalier disregard for the local residents and makes a mockery of the consultation process" - click here for the full response.